Figure 1: A Gift From A Very Fine Engineer. Thanks, Becky. I have now started on my next employment adventure. I can only say thanks to the wonderful team of people that I leave behind. They created the products that allowed the Fiber-To-The-Home (FTTTH) market to flourish. Tens of millions of FTTH products are now manufactured every year by companies around the world. These products are amazing in that for very low-cost they can contain such diverse technology: high-speed digital electronics, FPGAs, RF video, telephony, battery backup, and wireless. The team can be proud of what they have done. You succeeded where many others failed. Figure 1 shows something that is very special to me. 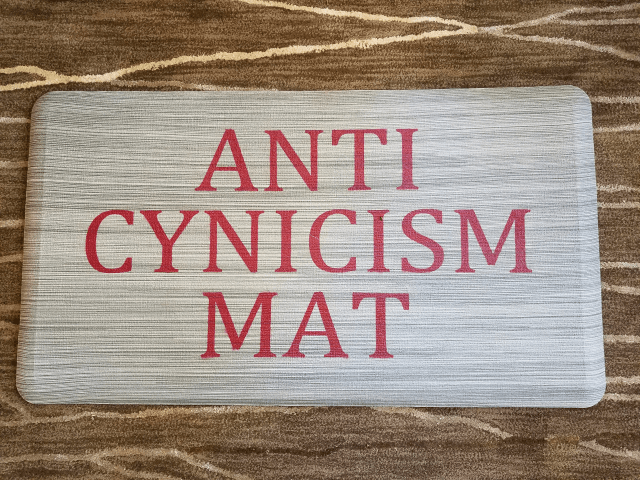 I have stood while working for many years on a beat-up old plastic mat that I referred to as my "anti-cynicism mat." I always told folks that while I was on this mat, there would be no cynicism. I also warned certain people that they should never stand on my mat because their feet burn would through it. On my last day, an engineer presented me with the mat shown in Figure 1. It will occupy a place of honor in my new garage/workshop, and I will cherish it.